On initial inspection, the sash windows in this Grade II Listed property, in the small village of Mawdesely, Lancashire, seemed to be beyond repair. Years of neglect had left the windows in a sorry state. Numerous broken panes of glass, rotten cills, flaking and peeling paint all made for the owners to believe that the windows could not be saved. After spending some time going over the windows it was discovered that they were made using Pitch Pine, a type of pine that was very durable and is now unavailable to buy due to de-forestation. Once it was discovered that the timber was pitch pine, we knew that we would be able to save the windows, and that they would last many more years to come. All broken panes of glass were replaced like for like with traditional "drawn glass", containing many imperfections and bubbles. The rotten cills on three of the windows were fully replaced, as were two bottom rails on the existing sashes. All the old loose putty was removed and re-pointed to achieve a slim elegant sight line on the glass. Our draught proofing system was installed cutting out all draughts and rattles, while allowing the sashes to operate smoothly. Once completed the owners couldn't believe the transformation. Passers by even commented on how good the "new replacement windows" were! As can be seen from the photographs, this particular job in Kendal, Cumbria, was one to test our double glazed sash's appearance against the other original sash's from the neighbouring property. The fact that the sash's had the unusual and lovely detail of an internal 90 degree curve in each each top corner, and intricate horns, meant that any discrepancy in the measurement or manufacture would result in an un-sightly and poor looking window. The customers had been tempted to install whole new double glazed windows, removing the original features and caracter that the tradtional box sash's bring to the property. 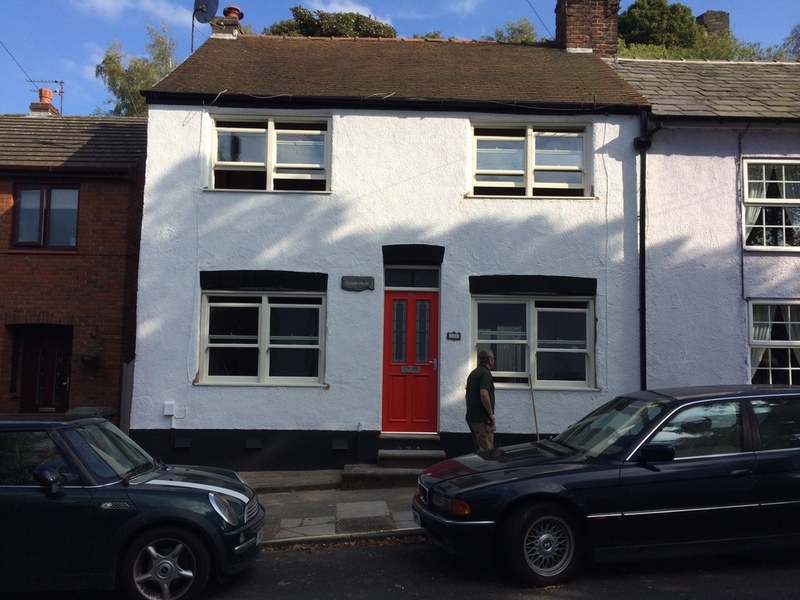 When they found out about our method of saving the box frames and installing new, fully finished, double glazed sash's, they were delighted that they could keep these original features, while also having the added benefit of modern double glazed units. This beautiful solid granite house in Lelant ( near St. Ives ), Cornwall benefitted from our draught proofing and repair service. The Sash windows had seen many years of neglect from a previous owner and were in need of urgent repair. The windows were draughty and would rattle in the wind, some of the cills were rotten and there were many pieces of broken glass to replace. All the rotten cills were fully replaced, with new hardwood timber sections, our draught proofing system was installed, the sash's were carefully renovated, replacing any broken glass with new drawn glass to match the original panes, and new brass furniture was installed. Once finished our customers were amazed at the reduction in noise, the reduction in draughts, the ease in which the windows could now be operated (due to the recording of the weights, and servicing of the pulley wheels), and how the finished appearance of the windows was now much improved. After spotting us working on another property in Southport, the owners of this property, also in Southport Merseyside, gave us a ring to ask for some advice with regards to the windows in their newly aquired, first house. The sash windows were in poor condition, as the bay had been suffering from some damp issues, and as a result the lower parts of the box frames and sash's had started to suffer from wet rot. The couple had recieve some prices for replacement PVC windows, but because of the arched heads, the price was out of reach for their budjet. Also, the fact that they wanted to save as much of the property's period features as posibble, meant they were delighted when we explained that we could save the original windows, while also making them draught proof, presentable and secure. All at a cheaper price than PVC replacements! We replaced the three cills that were rotten and removed the rotten interior panneling, placing the new hardwood cills onto damp course to stop the transfer of moisture from the stone cill beneath. The two bottom sash's from the wings of the bay were also replaced as these were beyond repair. We also replaced two of the floor joists in the bay that were rotten and sagging, and made up new panneling to match the originals, the window now works perfectly, is draught free, and secure. The customers have now decided to have the rest of the windows done in the new year. On completion of the job our customer had this to say: "Thanks Terry and Sean!! Stephen and I are really pleased with the panels and floor joists, you have done a really good job. Also the windows look great! Thanks again, Katherine." Another window to test our manufacturing capability was this unusual casement window on an old school house, in the small village of Haskayne, in West Lancashire. The original window was well beyond repair, and the owners really wanted the added benefit of modern low e double glazing, while keeping the unusual features and detail that the original window had. Using our expertise and experience in period windows, we were able to match the original features in the new window, while sympathetically including the added benefit of high performance double glazed units. Our new windows and sash's come fully finished in any colour, and carry a paint gaurantee. So once installed there is no finishing or final coats to be applied, saving on painting costs. Please click through the gallery of photos, to see the finished window. This old cottage in an historic area of Runcorn, Cheshire had suffered from having un-characteristic windows installed by a previous owner. The new owner asked us to provide him with windows that would improve the appearance of the cottage, giving it back some of its original character, We put forward the idea of having double box sash windows to keep the proportion right for the size of the openings. Utilising spiral balances to keep the glass area as big as possible, meant we could meet the customers requirements of letting as much light into the property as we could with this style of window. A new entrance door and frame was also supplied and fitted as part of the installation. All the box sash windows and entrance door and frame were manufactured using sapele hardwood, and pre-finished to our customers specification using teknos paints. All the sashes were double glazed, using a soft coat low 'e' glass and argon filled cavities to meet current building regulations. Heres the before and after images, showing how much of a transformation can be made by fitting the correct style windows. Its not everyday we get to work on the bell tower of a church! Upon a recommendation from one of customers, Halifax Minster got in touch to see if we could get their sash windows into working order again. After suffering for a number of years of ringing the bells, without being able to open the windows for fresh air, they asked us to get the windows opening properly while also running some repairs to broken panes of glass and rotten timber. We are always amazed at the different types of windows we come across and these were really out of the ordinary when it comes to sash windows. Being very thin in section, and having a sprung steel spring each side of the sash as a means of keeping it suspended, as apposed to the more common sash cord and weights method used to balance sashes. The sash's were removed and renovated, replacing any broken glass and repairing any decayed timber sections. The boxes were also renovated and repaired. Our draught proofing system was installed, and the sash windows re-assembled.